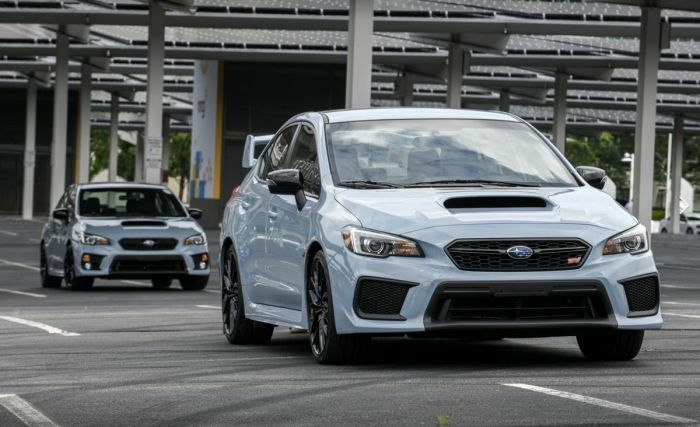 The special edition Series.Gray models are a limited production of 750 WRXs and even more limited for the 2019 Subaru WRX STI Series.Gray with just 250 examples being produced for the U.S. market. Fans at Boxerfest this weekend were the first to see the new limited production performance sedans. Even though it was a soggy, wet day, thousands of fans turned out to see the Subaru car show at FedExField in Landover, MD. The new 2019 limited edition WRX and especially the WRX STI will sell quickly, so you better hurry if you want one. Like the STI Type RA, the WRX STI Series.Gray is upgraded with Bilstein STI sport-tuned suspension featuring Bilstein dampers for the inverted-strut front suspension and double wishbone rear suspension. For 2019, all WRX STI 2.5-liter turbo boxers get a power increase to 310hp with the help of a new air intake and high flow performance exhaust. A retuned ECU and stronger pistons also help increased engine performance in the 2019 STI. Many fans are still not happy with the bump in performance, they wanted more than a 5hp increase. One thing Subaru did right, was how they priced the new 2019 WRX STI Series.Gray. The WRX STI Series.Gray is priced at $39,695. The 2018 Subaru WRX STI Type RA has a price tag of $48,995 for basically the same car. The WRX STI Series.Gray model comes in a Cool Gray Khaki exterior, features unique Crystal Black Silica badging and foldable exterior mirrors as well as 19-inch alloy wheels with a black finish. It also gets a silver finish with black STI logo on the Brembo brakes calipers. The 2019 Subaru WRX Series.Gray is priced at $32,595. It’s based on the WRX Premium and includes the Performance Package with Ultrasuede-trimmed Recaro seats, 8-way power driver’s seat, JURID front brake pads and moonroof delete. It also adds LED Steering Responsive Headlights, LED fog lights and Keyless Access with Push-Button Start. The limited edition 2019 Subaru WRX STI Series.Gray will likely sell quickly, so if you want one, you need to hurry. They will officially arrive at Subaru showrooms this fall. The regularly produced are not being sold that much. An extremely high proportion of vehicles are being personalized, which makes them unique. Subaru should focus more on getting as many STIs being sold as possible. Do the regular one right and make everybody happy to own it. Make it more and more reliable, which is the main concern. On the BRZ the tS should be the only version, not a limited one. The costs would come down by selling more. The more car Subaru sells the better for the company. The Focus RS being a good car lost many potential customers, me included, by playing the price over the MSRP which already give the dealerships a lot of money. Today they don't produce cars anymore with the exception of the Mustang. They had the GT350R which was produced in small numbers, but it was dramatically different from the GT, that they sell very well at a good value. Subaru, look at the Ascent, you don't expect any small numbers there, which is very good for the company. First Mitsubishi, now Ford. The competitors are giving up you have to stay alive by selling as many rumbling STIs as possible. Make sure not to kill the rumble either. 911s still have the engine in the back.